Sept 27, 2001 The beginning of the cleanup. Oct 16, 2001 A few more - just for the record. Nov 11, 2001 The most complete record of the shop in mid-restoration. 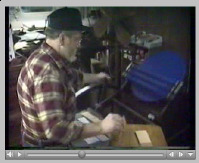 Jan 29, 2002 - Traveling Ludlow Repairman Dave "HotMetal" Seat visited and restored the old 1929 Ludlow Model "L" Type Slug Caster. An old Multilith Offset Press - model 1227. circa 1940?? ?